Be inspired by Singapore’s rich and diverse heritage! Craft and create your own memories of this island nation in unique private art workshop. 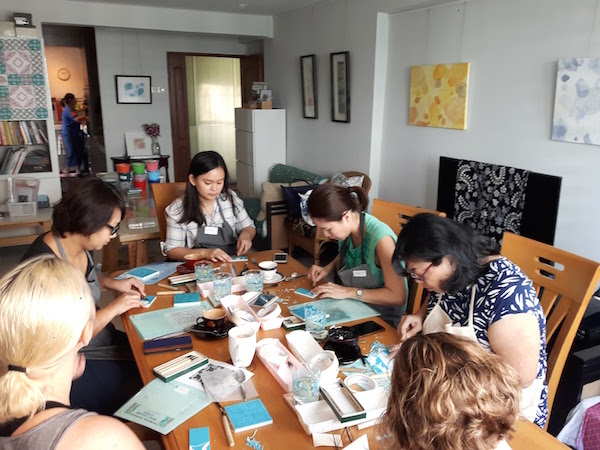 My workshops are a perfect leaving gift for friends, a great get-together with buddies and a creative reward for solo crafters. Suitable for complete beginners, intermediate learners and art enthusiasts, and available from one person onwards. 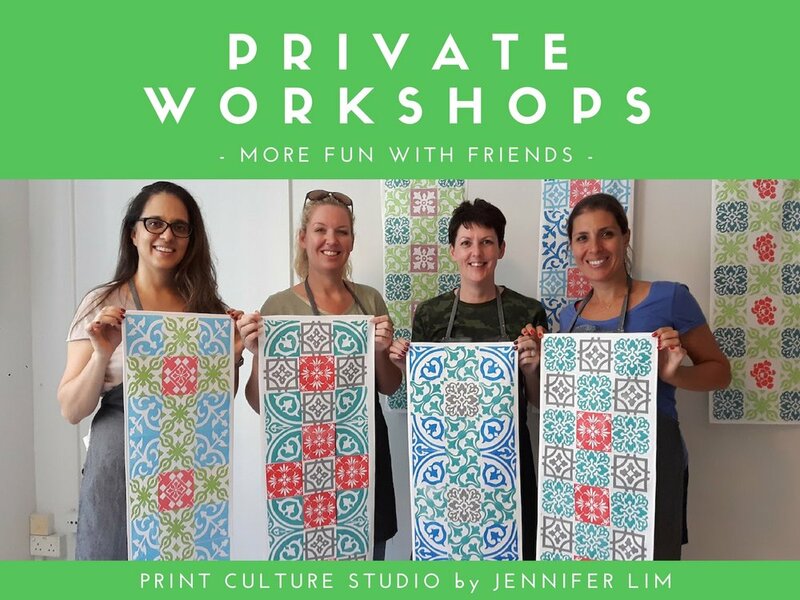 Experience the fun of Peranakan style printmaking in a heritage-rich session of creativity. Be inspired by Peranakan shophouse tiles and create a stunning hand-printed table runner or table cloth - by lunchtime! 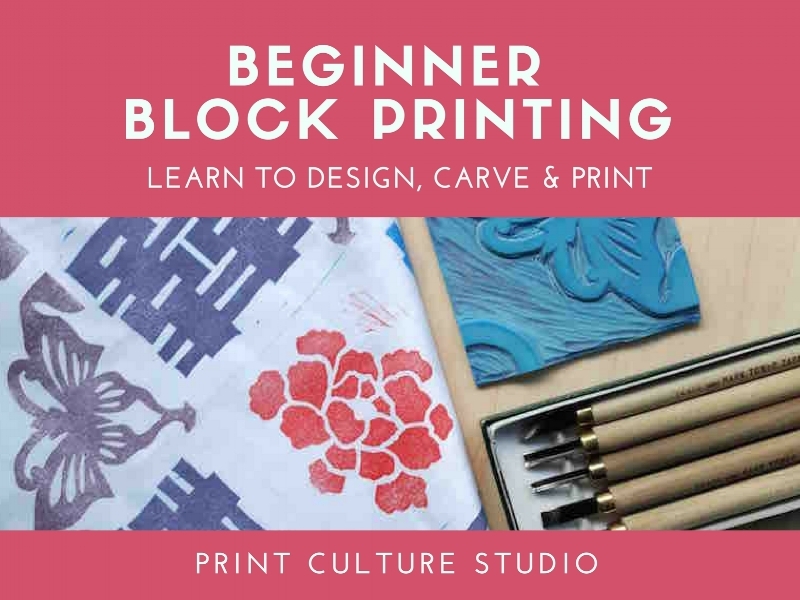 This streamlined printmaking workshop is perfect for the busy beginner with a selected range of blocks and design templates available. Your runner or table cloth is made from Japanese cotton sateen and ready-sewn for use straight away! An extensive collection of hand-carved rubber blocks featuring gorgeous patterns and motifs is available for your use. Enjoy the creative process of designing your selecting blocks and colourful inks to add your own distinct touch. No art experience is necessary and no carving is required. 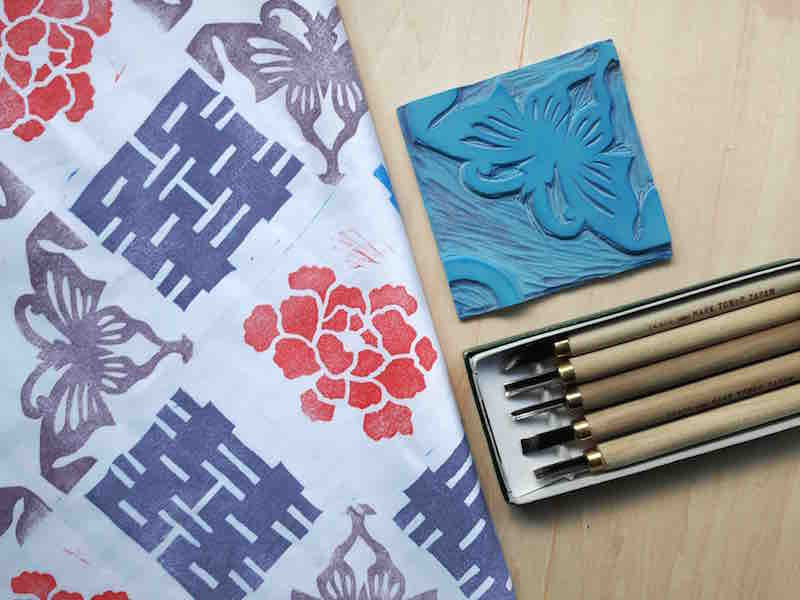 Enjoy carving your own linoleum block and creating hand-printed fabric in a fun workshop aimed at complete beginners! Learn to design your own pattern or choose from Peranakan tile inspired motifs. Take home a finished work ready to display or use in other craft projects. Carving & cappuccino go well together! Aprons are provided but it is advisable to wear old clothing underneath as inks used can stain clothing permanently. Inks are low-toxic and water-based but no responsibility will be taken for damage or injury to material possessions or health. Images and feedback from workshops may be used for marketing purposes unless otherwise indicated. Workshops have a minimum number of students and may be rescheduled or a refund given if deemed necessary. Tickets are non-refundable and if you are unable to attend, you may wish to find a replacement before kindly providing us with the person's contact details. Ticket sales close 48 hours prior to workshops due to preparation requirements.